3 Dvd, 3 sets of 6 A3 laminated Posters. Topics: Symptoms, Risks, Types of Cancer – Lung, Prostrate, Breast, Ovarian, Cervical, Uterine & Skin. 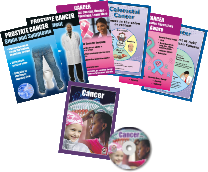 A4 folded Infolets, topics: Symptoms, Risks, Types of Cancer – Lung, Prostrate, Breast, Ovarian, Cervical, Uterine & Skin. 6 A3 laminated Posters. Topics: Symptoms, Risks, Types of Cancer – Lung, Prostrate, Breast, Ovarian, Cervical, Uterine & Skin.